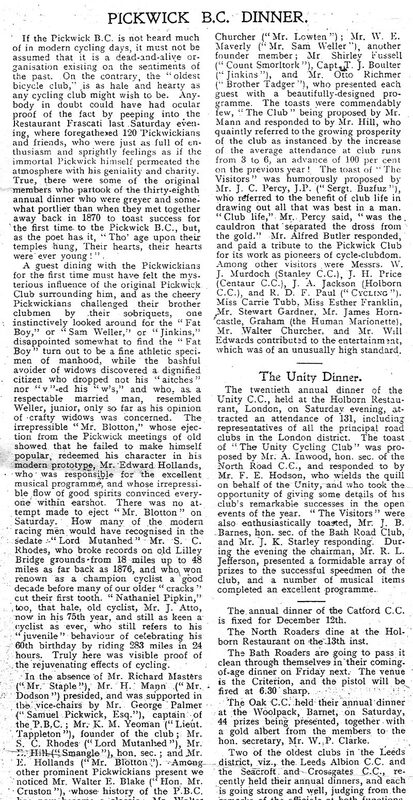 On the 22 June 1870 six pioneers of the bicycle (or velocipede) movement met at the Downs Hotel Hackney Downs, London, and formed themselves into a bicycle club. The question by what name they would be known was discussed and since Charles Dickens had just died, the title of 'Pickwick' was chosen, each member to bear a selected sobriquet from the varied characters abounding in the pages of Pickwick Papers. The Daily News of October 15th 1874 contained an interesting account of a tour of the Lake District by Messrs 'Pickwick', Tracy Tupman, Bill Stumps and Tom Smart. About a fortnight of adventure is recorded, and we are told the riders were perforce supplied with dry clothes at the Saracen's Head, Dunstable, and were sumptuously entertained by the ex-Mayor of Derby. Reading these last mentioned events fired my ambition to become a bicycler. I bought Charles Spencer's book published in 1870, The Bicycle its Use and Action, hired a boneshaker by the hour and after repeated tumbles in my first hour, acquired my balance. On my sixth hiring I rode to Enfield and back, about fifteen miles, having for the first and last time an attack of cramp in my thigh. Shortly afterwards I purchased a 'Gentleman', 48'' wheel, made by the Coventry Machinists Company, and joined the Pickwick Bicycle Club.